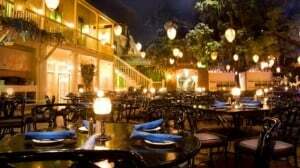 Dining options at Disney Parks and Resorts are incredibly diverse. Unlike many theme parks that seem to think of food as a complete afterthought, Disney Parks’ focus on amazing food will likely surprise you. The price tag isn’t always cheap, but the quality is better than any amusement park food I’ve ever tasted. Here’s a handy guide to the types of dining offered at Disney Parks, and a few can’t miss entrees and restaurants for your enjoyment. Serving up everything from Mickey shaped pretzels and ice cream to popcorn and churros, food carts at Disney Parks feature a variety of snacks, beverages, and between meal treats for your special day. Don’t Miss: Churros are a can’t miss at Disneyland and Disney California Adventure, located in nearly every land and area; the sinfully delicious combination of sugar, cinnamon, and doughy pastry goodness can’t be beat. Churros can be found at Walt Disney World, but you’ll have to do some digging to find them. Another can’t miss at Disney Parks on a hot day is their famous Dole Whip. Served only at Disneyland and the Magic Kingdom, the frozen Dole Whip has garnered such fame that lines for it can often be up to an hour long. Don’t be fooled, this exclusive unique treat is worth every minute spent waiting. Food carts take all forms of tender including cash, credit cards, and Disney gift cards. 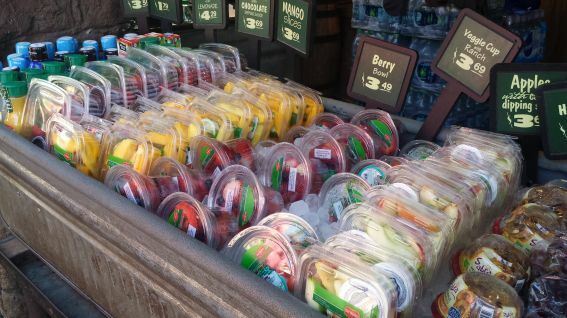 Healthy options are available (to the praise of moms everywhere) at numerous carts throughout the parks. You can snag fresh-cut and whole fruit, veggies, pretzels, hummus, fruit juice, and other healthy snacks. Official Disney policy states that you can’t bring outside food into the parks. This is typically waived for small snacks that don’t need refrigeration. Making up the bulk of the food service options at Disney Parks, quick service restaurants offer a wide variety of cuisine in a casual, walk up environment. Literally running the gamut of nearly every meal type you can imagine, from American favorites, to Asian cuisine, Mexican fare, Italian delights, Cajun specialties, and more, there is truly something for everyone. Disney California Resort: The lines will be long for corn dogs at The Little Red Wagon on Disneyland’s Main Street, U.S.A. The popular dogs are seriously amazing and worth every penny, but head to the Stage Door Cafe in Frontierland or Corn Dog Castle in California Adventure. Same tasty corn dogs, much shorter lines. Another can’t miss at Disneyland is the Monte Cristo Sandwich, served at Cafe Orleans in New Orleans Square (and at the Blue Bayou for lunch only). 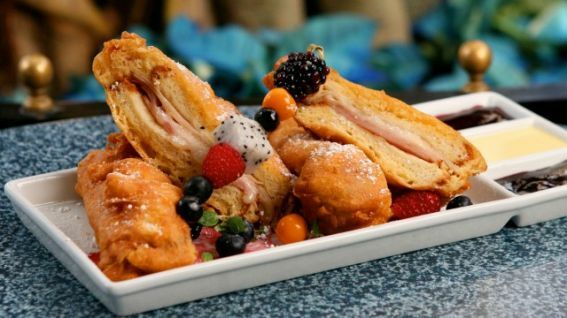 This deep-fried ham and cheese sandwich with sweet berry sauce might not be the healthiest menu option offered at the park, but it sure is tasty. Read kid-friendly reviews of every restaurant at Disney California Resort. Walt Disney World Resort: Don’t miss dining at the numerous countries in Epcot’s World Showcase, which offers your family the chance to taste cuisine from every represented country. The bratwurst loaded with sauerkraut, soft pretzels, and Bavarian apple strudel at Sommerfest in “Germany” are budget friendly and delicious. At Katsura Grill, Mom & Dad can enjoy beer & sushi while the kids snack on teriyaki chicken. Pinocchio Village Haus in the Magic Kingdom is a favorite of kids of all ages. 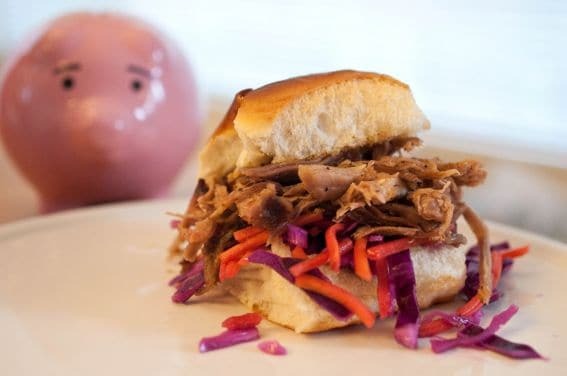 The Flame Tree Barbecue in Disney’s Animal Kingdom can’t be missed, just follow your nose to the amazing BBQ where you can score tasty St. Louis ribs and perfect pulled pork sandwiches. Read kid-friendly reviews of every restaurant at Walt Disney World Resort. Try to eat your meals during off-peak hours, avoiding the main hours of lunch and dinner on busy park days. (Avoid 12pm-3pm for lunch and 6pm-9pm for dinner.) You’ll save a ton of time in line and will have less difficulty snagging a table for your entire party. Consider dining in quick service restaurants at the neighboring Disney Resorts; lines are typically much shorter and you’ll get a nice breather from the busy-ness of the parks. If you have food allergies, dietary concerns, or restrictions, be sure to arrive early. Disney Parks takes your needs seriously, so allow time to meet with the chef and plan your meal. Read more tips on dining at Disney Parks with food allergies. Look for the Mickey Check icon on restaurant menu boards, an easy way to find the healthiest menu options for your family while dining at Disney parks. Consider purchasing a Disney Dining Pass for ease of use; details below. Escape the heat at Hungry Bear Restaurant in Disneyland (plenty of shady outdoor seating) and Garden Grill at Epcot (plenty of air-conditioned space to spread out)! If you want to pack your own lunch or dinner, Disney requests that you use the picnic areas outside the parks. Although sit down, table service restaurants do tend to be more expensive than quick service, you’ll be rewarded with a much needed break from the hustle and bustle of the parks as you sit down and enjoy a meal in one of Disney’s diverse restaurants. And although this break from routine while dining on delicious food is great, Disney excels at creating amazing atmospheres, making these restaurants all the more exceptional. 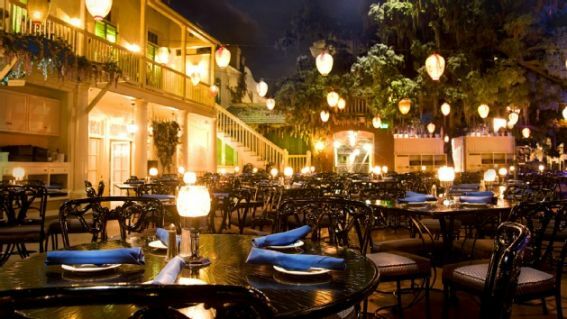 Disney California Resort: The Blue Bayou Restaurant in Disneyland’s New Orleans Square offers the best ambiance in the park. The perpetual twilight is lit by fireflies, colored paper lanterns, and twinkling lights in the “sky,” working together with the peaceful sounds of the bayou to make a romantic, and still kid-friendly, dining experience like no other. Walt Disney World Resort: Head to the Drive-In at the Sci-Fi Dine in Theater Restaurant in Disney’s Hollywood Studios; all-American favorites are served as you dine in a classic car shaped table or booth while watching clips under the “stars.” For an enthralling meal, don’t miss the Be Our Guest Restaurant in the Magic Kingdom’s Fantasyland; you’ll feel like you’ve stepped right into “Beauty and the Beast.” Don’t forget to head to the West Wing and look for the enchanted rose! Reservations are almost always required at table service restaurants in Disney Parks, so advance planning is crucial. Disneyland reservations can be made 60 days in advance, while Walt Disney World bookings start filling up 180 days out! 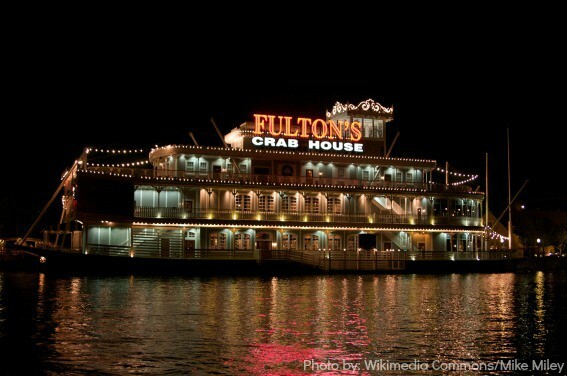 If you failed to make reservations in advance (because who hasn’t? ), call Disney on the day of your visit to see if they have any cancellations. You can often score some very coveted dining spots by calling the morning of. While at the park, check in for your reservations a bit before your assigned time. Having a reservation does not secure your party zero waiting time. If you check in a few minutes early, you’ll save yourself a bit of waiting time during very busy seasons. If you have food allergies, dietary concerns, or restrictions, alert Disney cast members at the time of your reservation. Read more tips on dining at Disney Parks with food allergies. Make the most of your magical Disney vacation by combining your mealtime with character meet and greets and live performances. 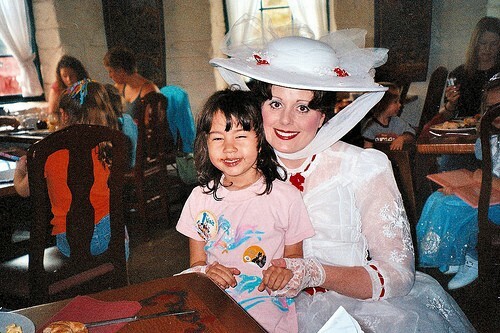 The beauty of a character meal is that all the characters come to you; no waiting in lines, no anxiety while hoping to get a glimpse of your little one’s favorite character. Disneyland California Resort: For the best way to see your favorite Princesses, be sure to snag a breakfast or dinner reservation at Ariel’s Grotto in Disney California Adventure. Prix-fixe prices make budgeting simple, and the food is fantastic. Choose the Plaza Inn for Minnie & Friends – Breakfast in the Park; the unlimited breakfast buffet is one of the most magical ways to start your day. Watch the stunning World of Color show from a reserved area available with dining packages available from three DCA restaurants: Ariel’s Grotto (dinner only), Wine Country Trattoria, and even fine dining options at Carthay Circle Restaurant. Travel Mama Colleen Lanin has a great post which will help you discover which character dining experience is right for your family. Explore all the Character Dining options at Disneyland California Resort. 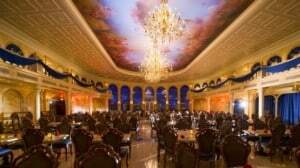 Walt Disney World Resort: With dozens of restaurants featuring character dining and dinner shows at Walt Disney World, you’ll want to choose your favorite well in advance. Princess fans will love visiting Akershus Royal Banquet Hall (Epcot) or Cinderella’s Royal Table (Magic Kingdom). Crystal Palace, located in the Magic Kingdom, is perfect for the littlest ones, with visits from Pooh Bear and his pals. ‘Ohana, located in Disney’s Polynesian Resort, is perfect for those seeking a Hawaiian getaway (with Lilo & Stitch), minus the airfare. Your kids will flip for the Hoop Dee Doo Revue dinner show at Fort Wilderness Resort, moms and dads will love the all-you-can eat BBQ, including beer and wine. 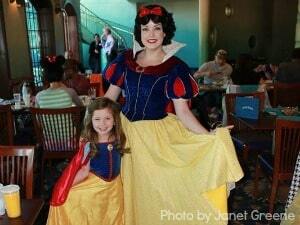 Explore all the Character Dining options and dinner shows at Walt Disney World Resort. Just like the other table service restaurants in Disney parks, you’ll need to secure advance reservations for the most popular character dining spots. 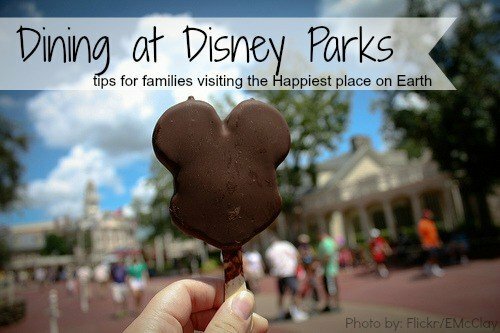 (Reservations can be made up to 60 days out at Disneyland and up to 180 days out at Walt Disney World.) Believe it or not, some of the most coveted spots book completely this far out. If you were not able to plan out your reservation, be sure to call Disney on the morning of your visit to check to see if there are any openings. Theme park tickets are not required for dinner shows and character meals that take place at a Disney Hotel or Resort. Many restaurants offer character meals at certain times of the day only. Be sure to ask for a character meal when making your reservation. A few breakfast locations actually open before the parks. Early birds can catch the worm and enter the park before the crowds. Some character dining venues include a souvenir photograph or other memento, included with the price of your meal. Kids under the age of three dine for free at buffet style restaurants, and the magic age for adults in Disney Parks is a surprising ten, so budget accordingly. Although there are certainly amazing dining options inside Disney Parks, it is sometimes helpful to step out of the parks and get a breath of fresh air. Downtown Disney is a restaurant, shopping, and entertainment hub on both coasts, and offers a wide variety of snacks, beverages, and dining options. 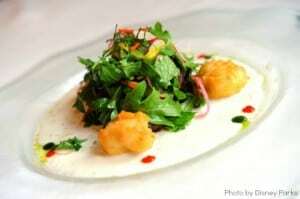 Resort hotels also offer a wide variety of restaurants, including quick service, fine dining, and even character meals. Disneyland California Resort: Offering some of the lowest prices in Downtown Disney, Earl of Sandwich features amazing sandwiches, salads, and more with a unique walk up counter and quick moving line. For the ultimate splurge, consider Napa Rose, located inside Disney’s Grand Californian Hotel & Spa where the farm-to-table movement, coupled with an extensive wine list, is enough to make foodies everywhere rejoice. 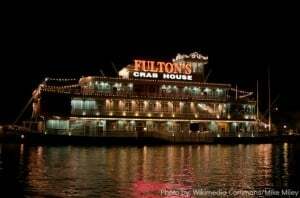 Walt Disney World Resort: You can’t miss Fulton’s Crab House in Downtown Disney; the riverboat replica offers an extensive wine and seafood list, as well as favorites for the littlest ones. The numerous hotels and resorts all offer exceptional off property dining, including the exclusive Victoria & Albert’s at Disney’s Grand Floridian Resort & Spa. This high-end restaurant experience is for kids age 10 and up. Be sure to plan ahead for this splurge: prix fixe menus start at $125/person. Access to Downtown Disney is pretty simple. From inside Disneyland, consider taking the Monorail, which drops you right in the middle of Downtown Disney without having to walk a bit. At Walt Disney World, quick and efficient Downtown Disney buses pick passengers up outside every park, arriving on a regular basis. You will have to exit and enter park security to get through Downtown Disney, so be sure to have your stroller and bags organized and ready to move through the line quickly. Reservations are accepted at some Downtown Disney restaurants, although they are much less necessary than inside the Disney Parks. Reservations are almost always required at Disney Hotel & Resort table-service restaurants. Theme park tickets are not required for entrance into Downtown Disney or to dine at Disney Hotels and Resorts. Consider a Disney themed shopping and dining splurge, regardless of whether or not you will enter the parks. 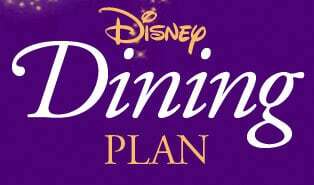 Guests staying at Walt Disney World Resorts can take advantage of the ultra-convenient Disney Dining Plans to help simplify the vacation dining experience. (Disney California Resort offers this for character meals only.) The plans allow visitors to pay in advance for varying levels of Disney meal credits, and then have the flexibility to use them throughout the parks. If your family fully takes advantage of the plan, you can score some amazing dining discounts while visiting Walt Disney World. The best part? The multiple levels work for a variety of family needs. From guests who only want a couple quick service restaurants and snacks, to those who want sit-down meals all day, every day, there is a plan for almost all types of diners. Plus, at various times of the year, Disney offers discounts and even FREE dining plans with select reservations. Be sure to schedule a few character dining experiences with your plan, even if you aren’t sure you will want them. They are the most expensive to purchase out-of-pocket and can allow you to get into the parks early. Your receipts keep track of how many credits you have remaining during your visit. Your credits expire at midnight on the day of your checkout, technically giving you a whole extra day in the park to use your credits. Although most restaurants participate in the plan, it isn’t all-encompassing and some top-tier restaurants that do participate use two credits per meal instead of just one.